While the other teams are still undecided on various things, Chennai Super Kings team has begun its final preparation for IPL extravangza. The team started its initial training session yesterday. Chennai SuperKings (CSK) Trainer Gregory King and seven chennai super kings players - Suresh Raina, Parthiv Patel, Joginder Sharma, Manpreet Gony, Sudip Tyagi, Shadab Jakati and S. Anirudha started their training session at Chepauk. Thanks to the semi-finals of the first division league, the other players missed out on training session. They are expected to join the training session this week. Gregory King believes the pleasant weather in South Africa during this time of the year could provide some relief to the teams as they grapple with a gruelling schedule in the Indian Premier League (IPL). The cricketers will train till April 3 and the second training session will start on April 6. Chennai Super King are planning to leave for South Africa on April 8. Buried Past: Finally an interesting information from the past. Have you ever wondered who took that decision to send Kapugedara ahead of Badrinath in Finals of IPL Season 1. All CSK fans agreed that it was a decision that made the difference between a win and a loss [See the post and the comments]. In Dinakar's article on Hindu, he makes it clear that it was Kepler Wessels who took that ill-fated decision overruling Dhoni's Decision of sending Badrinath. And this decision was one of the key reasons for losing his job as the coach of Chennai Super Kings. With the sudden shift in venues, Chennai Super Kings Management are working hard to accomodate this sudden change and get the team ready for the Safari Land. As a first step, the team is planning a 10 Day Camp ahead of the competition in South Africa. But the Indian, Australian and South African international players would be able to join the camp only at the end. The team also expects the South African presence in the squad - Ntini, Albie Morkel & trainer Gregory King to be very beneficial this season. Their key inputs and knowledge about the local conditions would be vital to the success of the team. Also Hussey, Hayden and Flintoff have a lot of experience in playing in South Africa. To top it, our captain, Dhoni has happy memories of South Africa where he skippered the Indian team to memorable victory in the inaugural T20 World Cup two seasons ago. With IPL shifting to South Africa, Chennai Super Kings Management has decided to cut the size of the touring Chennai Super Kings team to 18[News Source: Hindu]. To know the entire 29 member Chennai Super Kings team, visit Chennai Super Kings Squad. Thankfully... the team management has left the duty of picking the eighteen touring members to Dhoni & Fleming. But K. S. Viswanathan of India Cements promised that the travelling squad list would be out in two or three days. Parthiv Patel - As a backup wicketkeeper, he would be surely there. It is sad that Thushara & Bailey would be missing out this season. Though they are talented than some of the players in the eighteen, 4 foreign player rule effectively rules them out. What do you think? Is this the best eighteen out of the entire 29 Member Squad. It is official. Indian Premier League - Season 2 would take place in South Africa. Thanks to favorable weather & government, Lalit Modi & Co. have preferred South Africa over England. Thanks to South African domestic season, the tournament will start a week later on April 18th. So Andrew Flintoff's availability to Chennai Super Kings would be further reduced by a week. But Albie Morkel, Ntini and Hussey would be now available for the entire tournament. "It is quite depressing in that we won't have home matces. But at least the IPL is making it happen. " "Yes it is extremely disappointing that we won't get the opportunity to playin India. IPL proved to be such an exciting cricket tournament last year, what with international and national cricketers, lots of stars, celebs and the fast-paced T20 format. I don't know whether we will get the same environment again. But then, as cricketers, we are contract-bound and have to play wherever they organize the tournament. " After Flintoff expressed his disappointment over shifting of venues to a place outside India, all CSK Stars are joining the fans in expressing their disappointment. 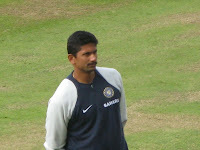 Badrinath has said that he would miss Chepauk atmosphere. But he believes that playing in international venues would not affect the chance of team making into semifinals and would do a great deal of good to his career. "Playing in South Africa or England will be interesting. And we really have a very balanced team that can do well anywhere." While Chennai Super Kings players are disappointed about missing Chepauk atmosphere, Chennai Super Kings managment is disappointed that they would lose 12.5 Crore revenues from gate sales. Still they are optimistic about creating a new fan base wherever they are asked to play. Also the managment is going to treat this like a tour and are not expecting to have more than 16-18 players in the squad. With the first ever auction in Cricket, cheerleaders and Businessmen, I thought that no seasons of Indian Premier League could rival the first season viz-a-viz drama. But just the second season of Indian Premier League has proved me wrong. Thankfully, Lalit Modi has not given up hope and is now running pillar and post to various offices of Central and State Governments to get the necessary permission for running IPL. My hopes are not lost too. I still believe that the current schedule submitted by Lalit Modi would be accepted by Central Government. But the biggest losers in all these drama are the fans like you & me. Delhi and Jaipur may not even play a single match in their home, while chennai super kings would be forced to conduct four of its home matches in an alien state. [News: Cricinfo]. Hopefully, Cricket in Season 2 matches the increased drama of this season and the next season is much more peaceful. Modi! Bring the Cricket On!